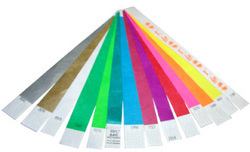 These wristbands are 25mm x 255mm and are tamper/stretch-proof and are water-resistant. They are sequentially numbered. No Minimum Quantity to order.